San Diego, CA, January 26, 2017 --(PR.com)-- Fans of bubble football or bump ball know that safety and quality of the product are two factors that simply cannot be compromised. 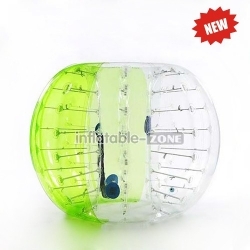 Inflatable-Zone, the one-stop online store of all bubble ball line of products, has come up with an unbeatable package of high quality products with an equally matched delivery and post-sale service that was until now lacking in this highly popular sport. Bubble soccer, also known as bumper ball or bump ball, has grown in popularity in the US, Europe and other parts of the world. Playable both outdoors and indoors, the wacky variation of football, where players are ensconced safely inside a soft, inflatable ball, the game is popular with families and at stag parties, corporate team building exercises, bachelor parties and birthday celebrations. If deciding on what inflatable product to buy and from where plagues buyers, Inflatable-Zone has ensured that anyone can freely browse and get amazing deals with quality and safety ensured. Apart from free shipping, buyers can customize their product with logos and free designs, get budget prices with promotional deals, and receive the goods in pristine conditions. Inflatable-Zone is export oriented and all goods are made by professionals with advanced machining technologies. Inflatable-Zone has emerged as one of the trusted manufacturers of inflatable products that come with most value for money, plenty of options for color, size and design, trusted quality standards, and ease of purchase online. The online stop offers bubble foodtballs, body zorb balls, water balls, inflatable pools, water floats and slides, inflatable bouncers and tents, and a whole range of other inflatable goods. Inflatable-Zone also offers opportunities for starting a renting business, where anyone can buy inflatable products in bulk and earn profits as well. All products come with a one-year warranty and free repair kits. “I needed a zorbing ball with pretty particular requests and Inflatable-Zone were able to build the balls to my exact specifications. I had great feedback from the seller from day one,” says Guillaume B, a recent customer.